This article describes an inexpensive optics application, teaching tool and optical system for detecting refractive density gradients. There are several methods commonly used to visualize refractive index or density changes in liquids, gases, liquids and solids. Generically these include shadowgraphs, schlieren and interferometric techniques. These sytems are used to visualize temperature gradients, shock waves in wind tunnels, nonhomogeneous areas in sheet glass, convection patterns in liquids, etc. Shadowgraph systems are often used where the density gradients are large. This technique also can accommodate large subjects, is relatively simple in terms of materials required and in terms of cost is probably the least expensive technique to set-up and operate. Interferometric techniques are usually highly sensitive, complex in set-up, can provide quantitative information but are expensive systems and can only deal with relatively small subjects. Schlieren systems are intermediate in terms of sensitivity, system complexity and cost. Schlieren systems can be configured to suit many different applications and sensitivity requirements. Typically, however, they are still considered too complex and expensive to implement in many cases where a simple density visualization system is needed. While discussed and introduced in the early '50's, the focusing schlieren method is one that uses no unusual or expensive optical elements and yet achieves high sensitivity at relatively low cost. Plus it relies on low-tech system "ingredients". As you can see by the attached illustration showing two students setting up a demo system, it is perfect for use in teaching situations where cost tends to be a primary concern. Unlike other systems, the focusing schlieren technique uses a broad light source instead of a small or point light source. This source is usually made up of a regular array of black and white elements. To make one requires simply a large translucent, opalescent, sheet of plastic onto which opaque stripes are fastened creating a black line/bright line effect. This screen is illuminated from behind with a single floodlamp or a flash, or a bank of them. If this screen is located closer to the "imaging" lens than infinity, then the image of this screen is reproduced at a distance somewhat larger than 1 focal length of the lens. If one makes a high contrast negative photograph of the image of the screen, then the bright areas of the subject will reproduce as dark, opaque, lines at the location of the image of the screen and the black lines will reproduce as clear lines. Then, if a subject of some kind is placed between the source and the camera lens, the image of this subject will be reproduced sharply at a distance larger then that at which a sharp image of the screen is reproduced. This essentially means that image points of this closer subject are made up, at the focus of the image of this closer subject, by light rays that come to the camera lens from a large number of source locations. Before these light rays become part of the sharply focused image of the subject they are part of the sharply focused image of the source. Now if the negative reproduction of the light source or screen is placed in the position where it was when its photograph was made, then at any position farther away from the camera lens no light will be seen because all the light from the clear areas of the source would be stopped by the dark lines of the reproduction of the source. If during the "steady state" condition of the systems the interfering physical reproductions of the gridlines of the source are displaced slightly from the pint where they cause a total extinction of light, then a grayish field of uniform brightness will be perceived. This field will become brighter until the physical lines completely cover the dark lines of the image of the source grid allowing all the light present in the clear, bright, areas of the source grid to pass. If the system is adjusted so that the obstruction and the image of the source grid are slighly misaligned and a uniform, grey field is seen, then local variations in refractive index that cause the light beam to move will become visible as local areas in the image plane that are brighter or darker than the middle grey selected that indicates the "steady state" condition. Thus local variations in density can be visualized. They can be recorded with simple auxiliary photographic equipment. To make a demonstration focusing system it is advisable to start with simple optical relationships and such a situation will be described below. The advanced worker is referred to the literature for more precise details on set-up and operation. From a practical point of view, the first step is to make a source grid as described in the "theory" portion of this article and as illustrated in the accompanying illustration. It is desirable to use a large aperture, relatively long focal length lens for the imaging lens. Some surplus copier lenses can be applied for this purpose. The source grid should be placed at a distance equal to four focal lengths of the lens. The subject field will be located at two focal lengths from the lens. Therefore the lens will be making a life sized reproduction of the subject. Due to this choice of distances, the lens will make an image of the source grid at a distance of 16 inches from the lens. This can be determined from the basic relationship that the reciprocal of the lens' focal length is equal to the reciprocal of the object distance plus the reciprocal of the image distance. To make a reproduction of the source grid a piece of high contrast film material (possibly stiffened by a piece of glass or held in or taped to a frame) is placed where the source grid comes to a sharp focus. It goes without saying that this must be done in such a manner that only light from the source grid falls on the photosensitive emulsion. This can be accomplished by baffling or building a light tight box around the lens to film area. It is important to note that the reproduction of the source grid will reflect any refractive index inhomogeneities present due to the inclusion of imperfect windows in the system and this feature alone often results in major cost benefits in terms of system setup since relatively low quality optical components can be used between the one lens in the system and source. 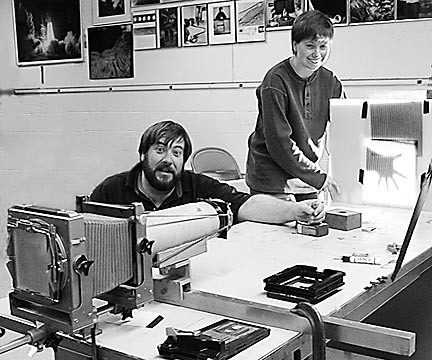 After the film is exposed and developed, it is replaced in its original position. This can be checked by visually examining the registration between the image of the source grid and its physical negative reproduction as well as tracking the appearance of the subject field on a groundglass placed, as mentioned above, at two focal lengths from the lens. It should be noted that slight misregistration between the two grids allows the operator to vary the brightness of the subject field on the groundglass. A camera can be aimed at the groundglass and images of the disturbances created by the rising density gradients can then ultimately be photographed. Conversely, if the whole system (from the lens back to the groundglass) is built in a light tight container and the lens is equipped with shutter, then film can be the ultimate image and exposures are made by simply operating the shutter or firing a flash that illuminates the source grid for a brief instant. 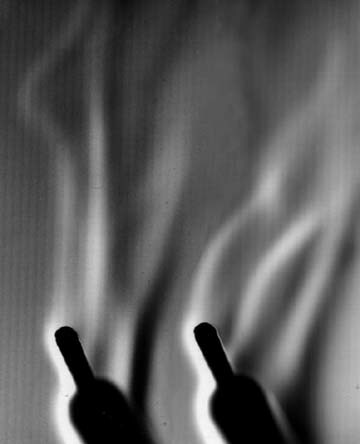 This is a focusing schlieren photograph made directly onto film showing warm air rising from hot soldering irons. For further reading on this subject locate articles and papers by Dr. Leonard Weinstein who is the NASA Langley Research Center where a large number of the wind tunnels are being reconfigured for Focusing Schlieren imaging. If you have questions or want to discuss flow visualization techniques in general feel free to write to me right HERE or later at andpph@rit.edu. This article has been requested times since December 22, 1998, when it was installed.